Once upon a time, Rime was set to be one of PS4's most lovely exclusives. The game has since gone on to become multiplatform, which carries with it a bit of good and a bit of bad. On one hand, more people will have access to the game and enjoy it - yay! On the other hand, the extra costs of developing, manufacturing, and publishing the game for Switch made it $10 / £10 more expensive than its PS4, Xbox One, and PC-bound siblings - boooo. 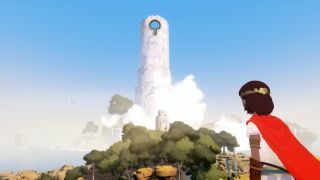 However, publisher Grey Box has announced that it's come up with a workaround: the digital version of Rime will cost $29.99 / £29.99 on Switch, making it the same price as on competing platforms. The physical version will still cost $39.99 / £39.99, but will include a download voucher for the game's soundtrack. Switch cartridges are more expensive to manufacture than blu-ray discs, that's a known fact. But Eurogamer also reports that it is Nintendo policy to make digital Switch games cost the same as their physical versions. It sounds like Grey Box is essentially getting around this limitation by making Rime's base price $30, but selling a physical edition with extra stuff (thus making it a sort of "deluxe" package, even if it's not called that) for $40. Virtually the same thing happened with Puyo Puyo Tetris, which was also more expensive on Switch than on PS4. In that case, purchasing a physical copy meant you got a keychain. And so even today, you can buy Puyo Puyo Tetris from the eShop for $30, or get a physical version for $40. It'll be interesting to see how many developers this impacts over the long run. There's still no release date for the Switch version, but Rime is set to come to PS4, Xbox One, and PC on May 26. It's been a long time coming, but based on my last Rime hands-on preview, I'm not worried.